Proceeds of home sale will benefit Oregon benefits, with costs of the project donated. The Portland area's annual Street of Dreams show is well-known for featuring the latest in higher-end and luxury homes, furnishings and fixtures. This year's show, which opens in Hillsboro in late July, will feature a home from the opposite segment of the market: a tiny house on wheels. 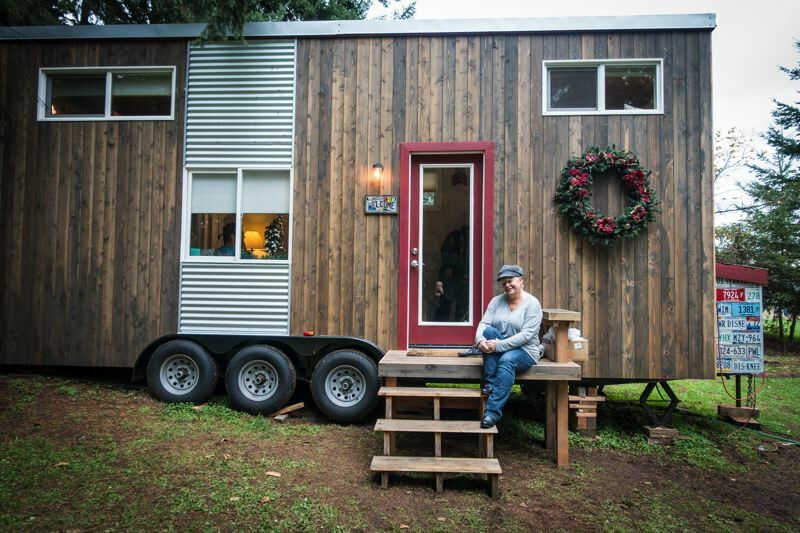 Washington County tiny house builder and advocate Michelle Bredeson Boyle has been selected to design and build a tiny house on wheels for the 2018 NW Natural Street of Dreams, which takes place July 28 to Aug. 16 in South Hillsboro. The construction is the first tiny home on display at Street of Dreams in the show's history. "We've been approached for the last several years about putting a tiny house in the Street of Dreams," said Adrian McCarthy, spokeswoman for the Home Builders Association of Metro Portland, which organizes the annual show. Tiny homes are "definitely a movement," she said. "People are interested in it." There will be six large elegant homes as part of the show, each on its own lot. A seventh lot is reserved for food concessions, and an eighth lot will be filled with the tiny house built by Boyle. It will be displayed much as other homes in the show, on its own, fully landscaped lot, McCarthy said. By no means do all the visitors to the annual show have the money to buy the homes on display. "The takeaway for visitors is to come be inspired," McCarthy said, by the homes, or the many amenities inside. "Maybe they'll be inspired to build a tiny house," McCarthy said. "With a tiny house, it's another way to show that you can have nice fixtures, but in a very small way." Boyle came up with the idea along with Gerald Rowlett, builder with Westlake Development. The tiny house will be auctioned off during the show, and all the proceeds will benefit Oregon military veterans, Boyle said. Costs of the project were donated by the contractors, suppliers and participants in the Street of Dreams. Honoring veterans is a tradition for the show, which has designated Aug. 7 as a day when veterans get in free along with three guests, McCarthy said. Boyle's house will be plumbed for natural gas, which is uncommon for tiny homes on wheels, which typically are powered by propane or wood stoves. Boyle lives in a tiny house on wheels she built outside of Sherwood. She also is a convener of the Portland Tiny Houses community on Facebook, and hosts the Tiny House Podcast. The South Hillsboro development, some 20 years in the making, will be the largest-ever master-planned community in Oregon, McCarthy said. When completed, it's expected to accommodate some 8,000 housing units with room for 20,000 residents. The Street of Dreams are the first homes to be built in that development. It would be seven, organizers said, except the buyer of the tiny house on wheels will move it off site to a lot of their choosing.